Attention all garlic lovers: this dish is for you. These black beans are more about the garlic than they are about the beans. 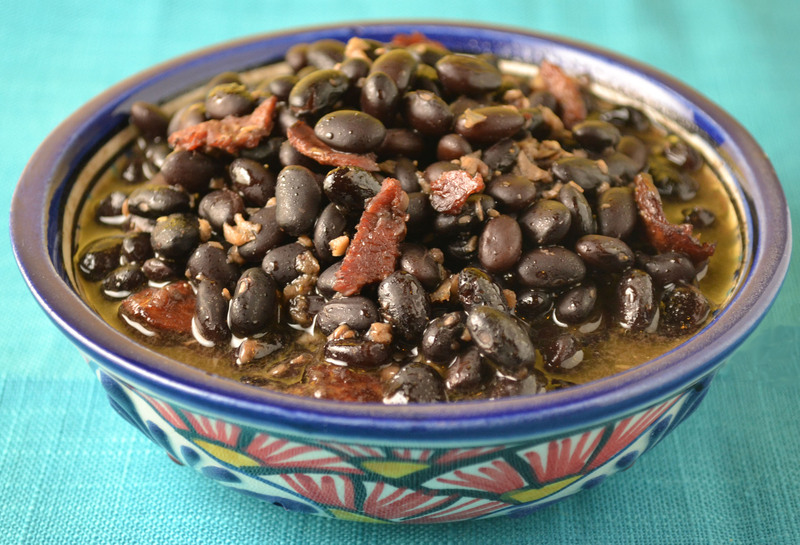 With a whole head of garlic minced, sautéed, and mixed into cooked black beans – this hearty garlicky dish is perfect for the never-ending cold winter nights. A little cumin adds an ethnic flare and when eaten with white rice, these beans become a fulfilling meal. And then there’s the bacon. 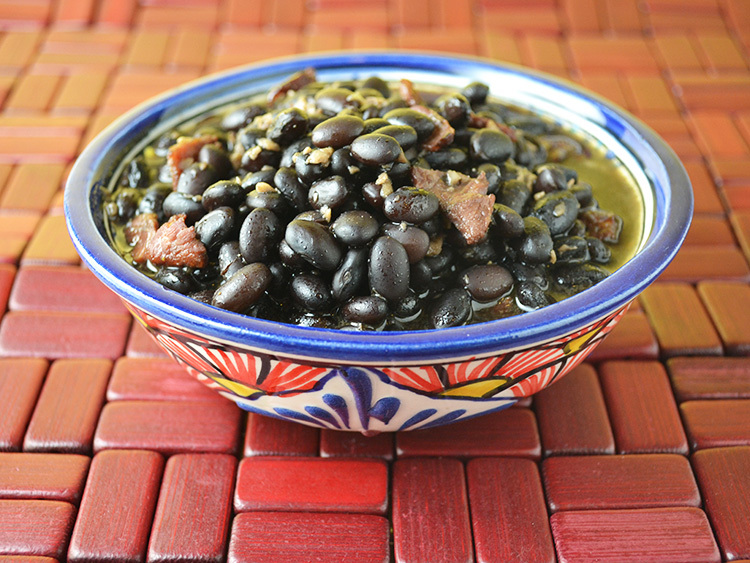 As if the garlic black bean combination wasn’t tasty enough, crispy bacon adds a level of smoky flavor. “The Art of Good Cooking” has a fair number of bean recipes. There are some with black beans, chick peas, white beans, kidney beans, etc. and almost all of them provide instructions for cooking the raw bean instead of canned. I’m not sure if raw beans were just my grandmother’s preference (and less expensive) or if canned beans weren’t as readily available as they are today – maybe a combination of both. I often find that unless you are infusing flavor into the raw beans while cooking them, canned beans are a fast and easy replacement. This recipe is no different. Canned beans can be simply heated in a little broth or water and then added to the garlic sauce as instructed. These Black Beans with Garlic Sauce then become even easier to make on a weeknight when your craving something warm and comforting. If using dry black beans, wash and soak overnight in water. In the morning, place in a deep pot with enough additional water to cover beans. Add a little of the garlic. Bring to a boil, lower heat and simmer until beans are completely tender. Drain beans, reserving some of the liquid for later use. Keep beans warm. Preheat oven to 325 degrees. Cook bacon in a skillet over low heat until crisp. Remove and reserve. Add remaining garlic to bacon fat and saute over low heat until soft. Place beans in a casserole. Stir in crisp bacon, sauteed garlic, cumin, salt, and pepper. Add about 3/4 cup of reserved liquid from the beans. Place in oven and bake, covered, for about 30-45 minutes. Serve hot. This is great! I made it today and put it over rice and my husband loved it. I had to cut down on the salt due to our low salt diet but all in all…………we will be making this over and over!